Questoverseas: Happy Chinese New Year! Today marks the first day of the Chinese New Year, the Year of the Ox, which is traditionally associated with calm, fortitude and success through toil...fitting for credit crunch times! As could be expected from the birthplace of the firework - the celebrations in Beijing were spectacular, with the World's largest uncoordinated fireworks display being held in the city. 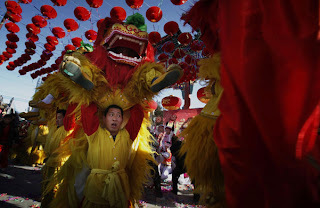 The New Year has been brought in with parties, parades and festivities by Chinese communities across the globe.